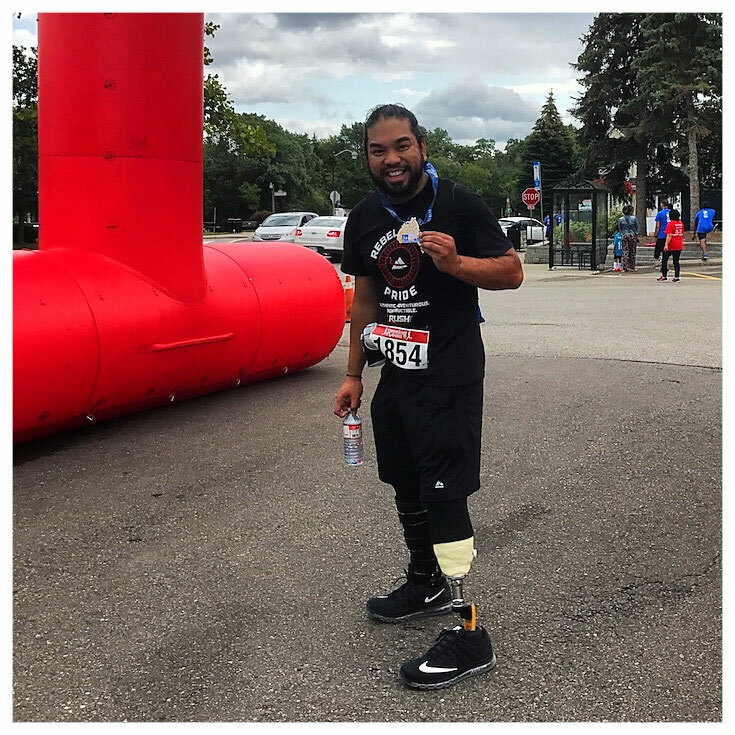 Aristotle Domingo, also known as Todd to his family, friends, and social media followers, has never understood the meaning of “limits.” After surviving septicemia in 2001, Todd lived with peroneal nerve injury (foot drop) until his recent left below-knee amputation in 2017. He spent 16 years battling infection, pain, and other medical issues due to complications. Below is an account of his speedy recovery from his recent amputation surgery to participating in his first 5K race. I knew right off the bat that the visit to my doctor about an infection on my left foot would lead to a conversation we had been avoiding for years. I wasn’t sure I had the patience for yet another round of intravenous antibiotics and sitting on the couch for two weeks, waiting for the infection to go away. I knew the decision that needed to be made that day. My doctor hesitated to raise the subject as we both looked at my swollen left foot in silence. When he looked up and our eyes met, I knew I had to be the one to say it: “Amputate it.” After numerous surgeries to save the foot and years of various infections, constant pain, and other medical issues that resulted in a poor quality of life, I knew I needed to make the decision to get my life back. After numerous tests and consultations with my orthopaedic surgeon, my left leg was amputated below the knee on January 10, 2017. The day of the surgery came and I didn’t think much of it—not the risks, the recovery, nor the length of time I would be in the hospital, and certainly not the hard work ahead. I had one goal in mind and that was to be able to walk my dog for two blocks without crying in pain. Whatever that meant at the time, I knew that everything between my surgery and my goal were only things that needed to happen. How they happened, why, or the order in which they happened didn’t matter to me. The focus was always the finish line before I started on this journey. On day three post-surgery, I started physiotherapy by hopping on my “sound” leg for short distances in the hospital hallways. In the wee hours of the morning when the hallways weren’t too busy, I would sneak out and do wheelies on my wheelchair to strengthen my arms. I started doing things for myself and became as independent in the hospital as I could: showering (with the residuum protected, of course), getting dressed, and even going to the coffee shop to meet visitors instead of meeting them in my room. I didn’t want it to feel like I was in a hospital, so a social aspect was very important to my recovery. Ten days post-op, I was transferred to a rehabilitation centre to complete five weeks of physiotherapy and occupational therapy. I immediately told my therapy team what I wanted to accomplish—walk my dog without pain. Right away we started with strength training to prepare me for my prosthesis. In addition to my physio at the hospital’s gym, I followed the bed and in-room exercises they provided me, which included ab crunches, leg lifts, and stretches. By the second week in recovery, while still in staples, I got casted and received my first check-socket with a Solid Ankle Cushioned Heel (SACH) foot to start walking with. Immediately after putting it on, an excitement came over me and I knew what I wanted to do next—I wanted to run again. As soon as I got back to my room, I went online and searched for ways in which an amputee can run. I read studies and blogs of amputee runners sharing their experiences and about Paralympian successes. I said to myself, “I want to do that. To run. Just run. If I can run again, I will be happy.” With determination, I told my therapy team, physiatrist, and prosthetist my new goal. I challenged them every day by requesting more intense physio sessions, and they delivered. By the time I was released after five weeks of in-patient care, I was able to walk out of the hospital without any walking aids or a wheelchair. Another five weeks of intense outpatient rehab followed using my definitive (final) foot. I told my new therapy team my goal of running a 5K one day. They created a strength, core, and balance training program specifically for a below-knee amputee to get me ready for racing. Between sessions, I walked around my neighbourhood and increased my walking from two blocks to five kilometres while timing myself and improving my pace. Eventually, as I was getting used to the mechanics of my prosthesis and learning to adapt, I started light jogging between brisk walks to improve my pace, time, and endurance. I also joined a local gym and started participating in High Intensity Interval Training (HIIT) to further my athletic conditioning. I felt stronger and noticed improvement in my body’s muscle mass as well as a reduction of fat mass. I started planning what and when I ate, and made sure I was getting eight hours of sleep each night. In essence I was training like an athlete, with assistance from my therapy team to ensure I was safe. My first 5K race was on May 16, 2017, just five months after surgery. Believe it or not, I registered for the race while I was still recovering in the hospital—I kept that a secret the entire time I was in therapy. I needed it to be an epic event for me. Finishing my first race meant I had officially started my journey as an amputee. It meant I could get up every time I was struck down. It meant that I am mentally and physically stronger than I could ever imagine. Guest post by Aristotle 'Todd' Domingo. 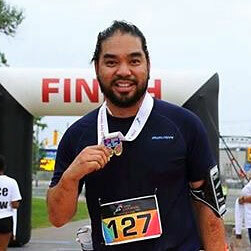 Todd is the founder of the Amputee Coalition of Toronto - advocating and bringing awareness to living actively with limb loss. He lives in Toronto, Canada.